Robert Byrd recently won a 2013 Sibert Honor and an Orbis Pictus Honor for Electric Ben. In January, we included the title in a list of books from 2012 we wished we had reviewed. Well, there's no time like the present! Upon opening the picture book biography, it's easy to see why this book was recognized by the Sibert committee. Byrd's ink and watercolor illustrations will attract the attention of middle grade readers. The layout of each page is different, which makes turning the page exciting. On one page, the intricate illustrations show Franklin as a young man standing on the streets of Philadelphia munching on bread with brick buildings and the waterfront in the background. On the accompanying page a small illustration in a circle depicts Franklin on board a ship writing his observations of flying fish and dolphins. Detailed captions describe each of Byrd's illustrations. The book follows Franklin's life from his early years growing up in Boston to his move to Philadelphia where he started his printing shop to later years spent in Europe. Readers will learn about Benjamin Franklin the witty writer, inventor, and statesman. Franklin was constantly looking for ways to help improve the lives of others. We can thank Mr. Franklin for libraries. He formed a "lending club" that became the first library in the America. "Franklin was the key founder of the first hospital in America. He sponsored a police force, where townspeople paid to have their streets patrolled. He formed a volunteer fire brigade. It became the nation's first full-time firefighting force." Even though this is a picture book biography, the audience is for older elementary and middle school students. There is a lot of print on page that might overwhelm beginning readers, but proficient readers will be amazed by the accomplishments of our founding father. The back matter (author's note, timeline and bibliography) is comprehensive. Readers will be interested in the "About the Pictures" section where Byrd explains how he based the color palette on Colonial colors and describes the research to illustrate the book. 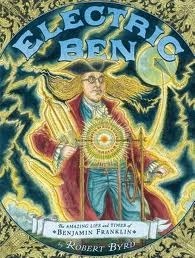 Electric Ben deserves a place in a juvenile biography collection. It's unlike other biographies of Benjamin Franklin, and it's a prime example of how picture books can be for older readers, too.